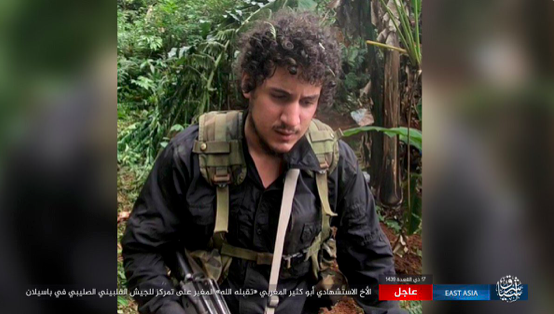 Morocan jihadi Abu Kathir al-Maghribi is now the prime suspect in the suicide van attack. Defence chiefs believe that last month’s suicide van blast on Basilan Island may have been the work of a Moroccan jihadi. The Islamic State group has already claimed responsibility for the explosion on July 31, which killed 11 people at a security road block. It is now believed that the attacker’s intended target was a gathering of children nearby, but his van stalled at the checkpoint before the explosives detonated. Shortly after the attack, a Twitter user called ‘TerrorMonitor’ shared a photo of a certain Abu Kathir al-Maghribi, whose face matched eyewitness’ accounts of the van driver. The same picture was shared by an account linked to IS. It is believed that Al-Maghribi first joined Abu Sayyaf on Sulu Island. Intelligence suggests he then moved to Basilan to avenge the death of his child who was killed in an encounter with the military. Military intelligence also suggests that the bomb was intended for school children in Lamitan. Speaking to the Associated Press, Interior Undersecretary Eduardo Ano said: “He was targeting an event that gathered about 3,000 people but something went wrong with his van.” The event was to promote good nutrition among the young. According to reports, the suspected militant asked villagers to push his white van after it stalled. However, they became suspicious after seeing wires protruding from plastic tanks in the vehicle. Before they could raise the alarm, the vehicle exploded, killing a soldier, five militiamen, four civilians and the driver. The blast wounded eight other people, including army scout rangers, who were approaching to investigate the van and the driver. The explosion tore a crater on the road and damaged the militia outpost in Lamitan in one of the worst militant attacks in the country this year.